(lite version) Add an enhanced exTree component to your application. exTree provides the entire range of capabilities you would expect to see in a state-of-the-art tree component. 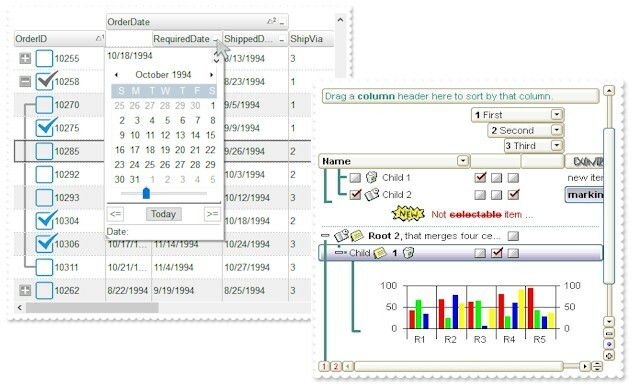 The exTree control simulates a simple tree, a multi-column tree, a list or a listview control. The exTree component lets the user changes its visual appearance using skins, each one providing an additional visual experience that enhances viewing pleasure. Skins are relatively easy to build and put on any part of the control. Ability to generate the control's template at runtime. Single or Multiple Lines/Levels Header support. Sorting by Single or Multiple Column support. Ability to filter items using patterns that include wild card characters like *, ? or #, items between two dates, numbers, with an easy-to-use interface. eXTreeCube The eXTreeCube library provides fisheye representation / cube map texturing of different components such as calendar , multiple - columns tree view and so on.